Red Azolla is the name of the growth which effects the man made lakes at Bellvista. Another name it is called is Ferny Azolla. The scientific name for is Azolla pinnata. 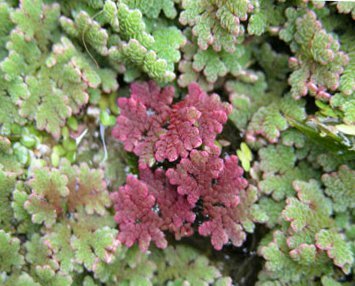 Red Azolla or Ferny azolla is a native Australian, there are six more species worldwide. This fern floats on water and one of only six, free foating, aquatic fern species. It is a food source for fish, shrimp, waterfowl, insects, snails, crustaceans and worms. It provides habitat for many of the small organisms that we have just mentioned. Sunlight shinning in the water, which is essential for algal growth (Algae at one time were considered to be a plan, but are now classified separately because they lack true roots, embryos, leaves, and stems) and it takes up nutrients from the waters, stifling the availability of this food source for the algae. Azolla can also hamper the growth of some aquatic plants, such as Water Hyacinth and Salvinia as it limits the quantity of nutrients to these plants. The Azolla grows in waterways in dense patches, which can look like a green or red carpet. It grows from 4 to 10 inches (1 cm to 2.5 cm) wide and is a bright green color. Its color changes to deep red when it is exposed to the sun, this is were the name Red Azolla comes from.